Disclosure: I am a member of the Collective Bias® Social Fabric® Community. This Stuffed Chicken Parmesan Rolls recipe shop has been compensated as part of a social shopper amplification for Collective Bias and its advertiser. 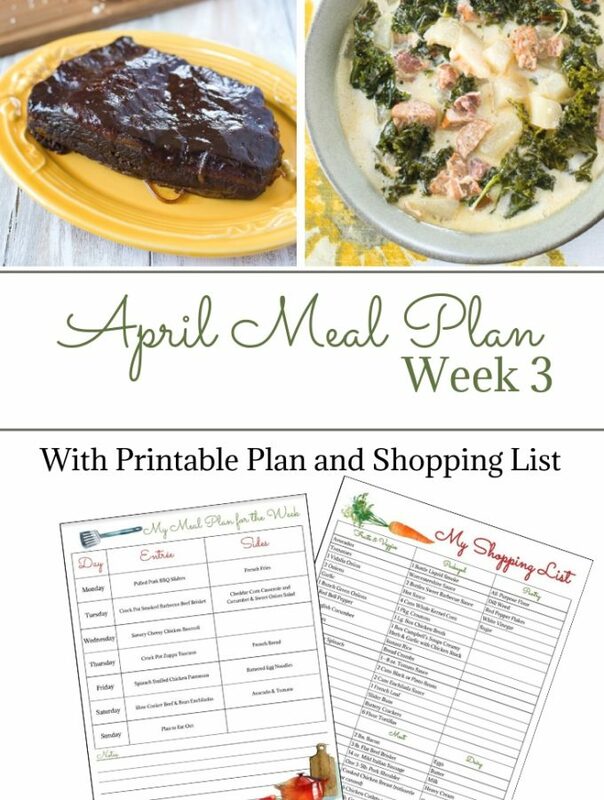 Have you decided on your Easter menu yet? 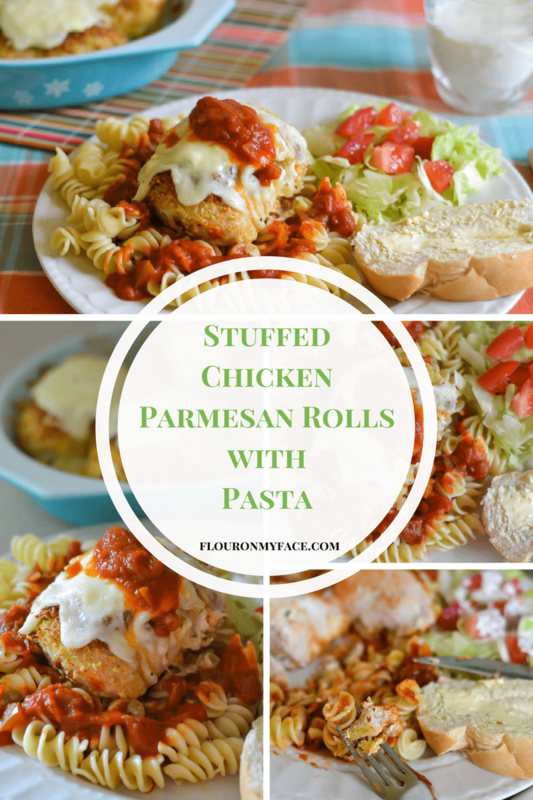 If you have you may change your plans once you see this Stuffed Chicken Parmesan Rolls recipe I made. March 2017 Update alert. It has come to my attention that Kraft Fresh Take is no longer available!! 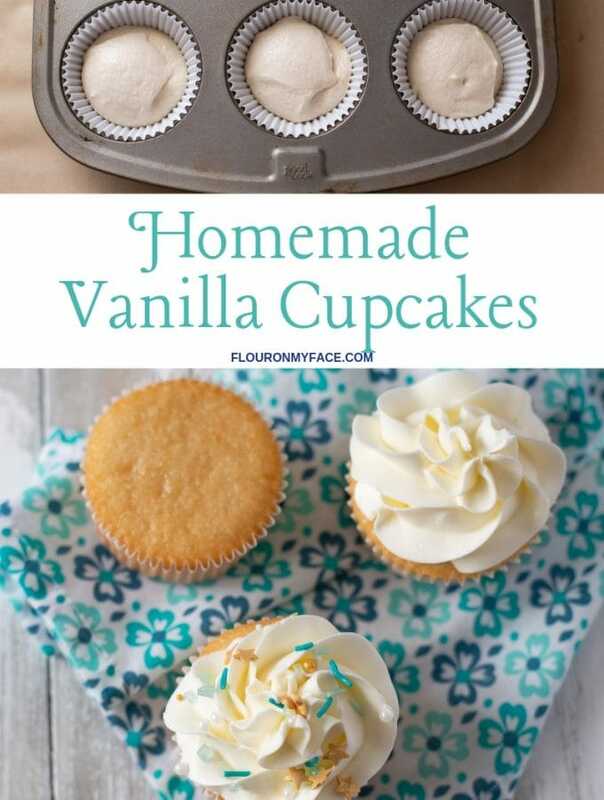 But the good folks at Kraft have come up with a Fresh Take Copycat recipe you see below. 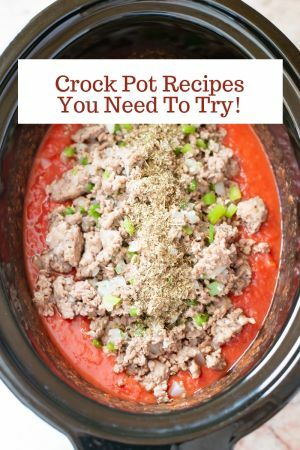 For all the copycat recipes for each Copycat Fresh Take Flavor go here. Some years I cook a turkey and ham for Easter dinner but some years I like to change it up a bit. It looks like this year will be one of those years. 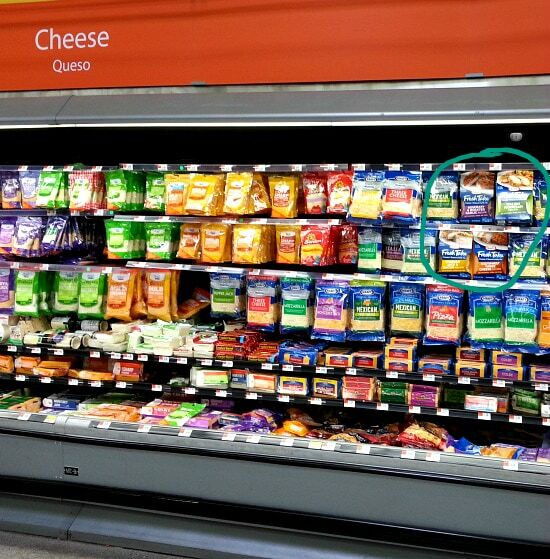 Have you tried any of the Kraft Fresh Take chicken bread crumb and cheese coating mixes yet? If not you don’t know what you are missing. 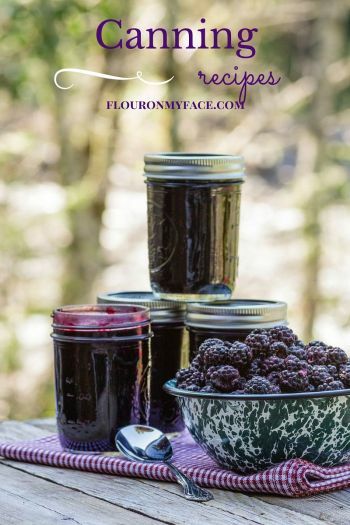 Each flavor comes with recipe suggestions on the package but I like to come up with recipes of my own. This Stuffed Chicken Parmesan Rolls recipe is a spin off from the classic Chicken Parmesan recipe. Have you made plans for your Easter celebration? Over the years our Easter celebrations have changed. As our family dynamics have changed so have the way we celebrate most holidays. When my kids were small (life wasn’t as complicated ha!) we colored eggs and they couldn’t wait for the Easter Bunny to visit. We had huge Easter egg hunts when we lived in a home that had acreage. Now my two oldest children have children of their own. The holidays start to get a little complicated when you have a bunch of grandparents all wanting their fair share of time for holiday celebrations. No matter what each Easter I make sure to coordinate a few hours the day before to have all the grandkids together so they can color eggs with Grammy. While I was shopping at Walmart the other day I picked up the ingredients to make this Stuffed Chicken Parmesan Rolls recipe using the Italian Parmesan Kraft Fresh Take. I had to test this recipe idea out before I served it for Easter dinner. I had to make sure it got a passing grade from the immediate family before I served it for Easter dinner. I don’t want to brag……….but oh my the compliments came pouring in from everyone who ate my Stuffed Chicken Parmesan Rolls. Everyone in the family loved it and that is a rare occurrence in this family! 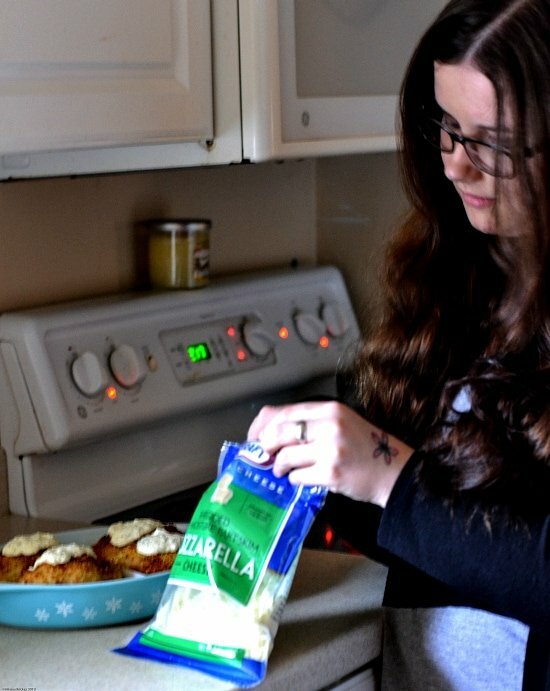 This Stuffed Chicken Parmesan Rolls recipe is pretty easy to make. This was actually my first time making a “roll” and I was so happy with the way it turned out. The Italian Parmesan Fresh Take tastes so good. It has all the great flavors you would expect from an authentic chicken parmesan dish with a little something extra special from the cheese. 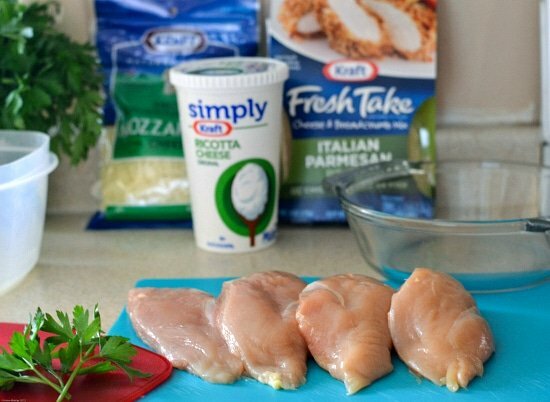 To make the Stuffed Chicken Parmesan Rolls recipe and serve it over pasta you will need boneless chicken breast, one package of Kraft Italian Parmesan Fresh Take, mozzarella cheese, ricotta cheese, an egg, rotelle pasta, salt, pepper, chopped garlic and fresh or dried parsley. First thing you need to do is mix up the ricotta filling. I like to add a little bit of cheese whenever I am making a ricotta filling for a recipe like this stuffed chicken breast or even a recipe like this Baked Cheddar Jack & Bacon Ravioli Appetizer I make using the Kraft Fresh Take Cheddar Jack & Bacon coating. The added cheese takes the ricotta filling up a notch in my opinion. Mix the ricotta cheese,egg, mozzarella cheese, chopped garlic, salt, pepper and parsley in a bowl. Cover it and place it in the refrigerator while you prepare the chicken breast. 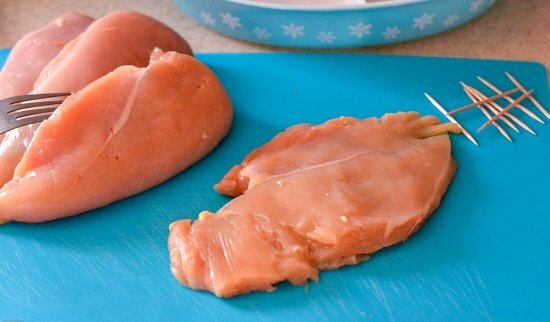 With a meat mallet pound the chicken breasts until the entire length of the breast is about the same thickness. Down the center of each flattened chicken breast place about 2 teaspoons of the ricotta filling, keeping the ricotta to the center of the breast. (so sorry but I didn’t get pictures of this step!). Return the remaining ricotta cheese mixture to the refrigerator until the chicken is finished cooking. Roll the breast up and secure with a toothpick (keep count of the number of toothpicks you use). 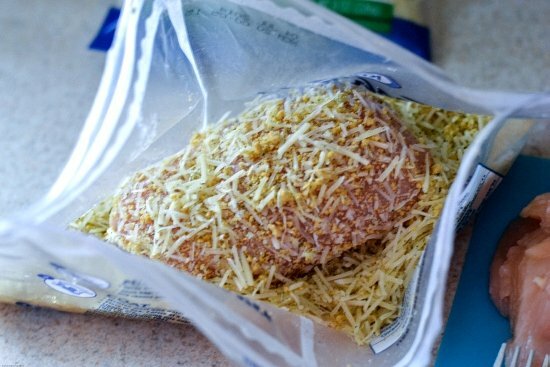 Place the chicken breast roll in the brilliant Fresh Take coating bag. 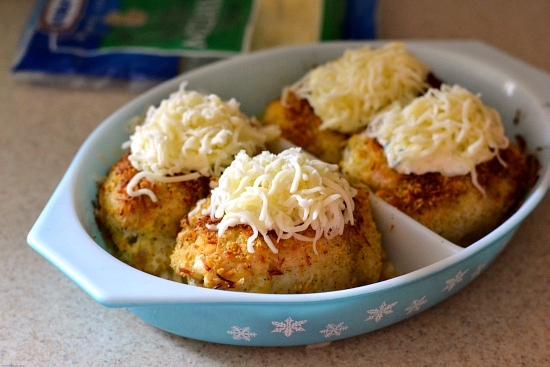 Gently roll the breast in the Italian Parmesan chicken coating. Being sure to evenly coat all sides of the chicken breast. Place the chicken rolls, seam side down into a baking dish that has been lightly sprayed with cooking oil. Bake the chicken rolls in a preheated 375F. oven for 20-35 minutes or until the thickest part of the chicken rolls registers 160F on a meat thermometer. Remove the chicken from the oven and top each breast with 1 teaspoon of the reserved ricotta cheese and a handful of mozzarella cheese. 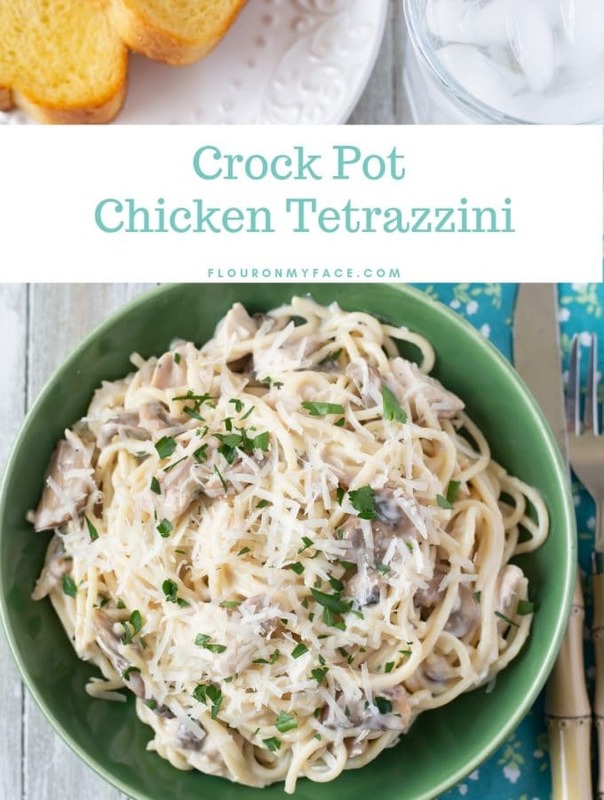 While the chicken is cooking you should start cooking your pasta and heating a jar of your favorite sauce. Return the chicken to the oven and cook for about 10 more minutes until the mozzarella cheese has melted. Remove all the toothpicks before serving! 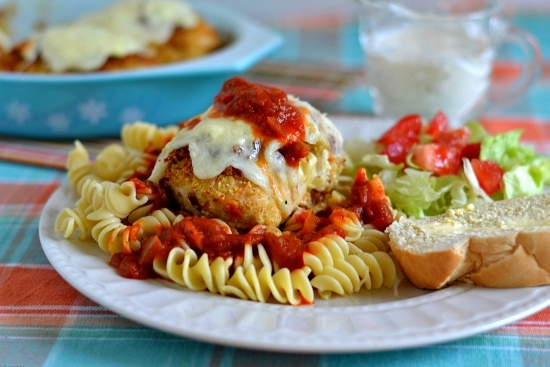 Serve the Stuffed Chicken Parmesan Rolls over a bed of rotelle pasta, with a salad and some french bread. Prepare the ricotta filling by mixing the egg, ricotta cheese, parsley, ¼ cup mozzarella cheese, salt and pepper in a small bowl. Put the ricotta filling in the refrigerator while you prepare the chicken. 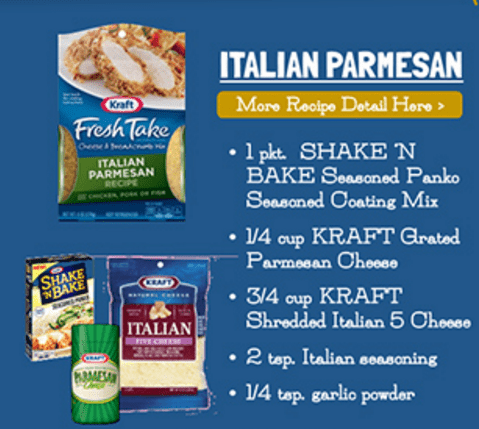 Open the package of Kraft Fresh Take Italian Parmasan and mix the toppings together, set aside. Spray a shallow baking dish with a non stick spray. 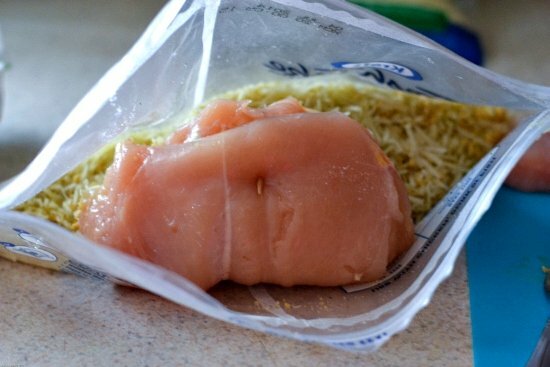 Trim any fat from the chicken breasts and pound each breast evenly flat. Spread about 2 teaspoons of the ricotta filling down the center of each chicken breast. Return the reaming ricotta filling to refrigerator. You will need it when the chicken is done cooking. Place one breast roll at a time in the Fresh Take bag and gently turn until roll is covered in the toppings. Place in the shallow baking dish seam side down. Bake the chicken for 20-35 minutes or until the center of the thickest Chicken roll reads 160F on a meat thermometer. 10 minutes before the chicken is done carefully remove the baking dish from the oven. Top each chicken roll with a teaspoonful of the leftover ricotta cheese filling and about ⅛ of a cup of the shredded mozzarella cheese. Discard any left over ricotta filling. Return to the oven and continue baking until the chicken is cooked through and the mozzarella cheese has melted. Remove all the toothpicks before serving!! Serve over your favorite pasta and sauce, with a salad and bread. Print the Stuffed Chicken Parmesan Rolls recipe below. Stuffed Chicken Parmesan Rolls are easy to make when using a copycat Kraft FreshTake recipe now that the FreshTake product is no longer available to purchase. You can make your own flavored bread crumb topping very easy at home. Prepare the ricotta filling by mixing the egg, ricotta cheese, parsley, 1/4 cup mozzarella cheese, salt and pepper in a small bowl. Top each chicken roll with a teaspoonful of the leftover ricotta cheese filling and about 1/8 of a cup of the shredded mozzarella cheese. Discard any left over ricotta filling. I hope you enjoy it as much as we did! 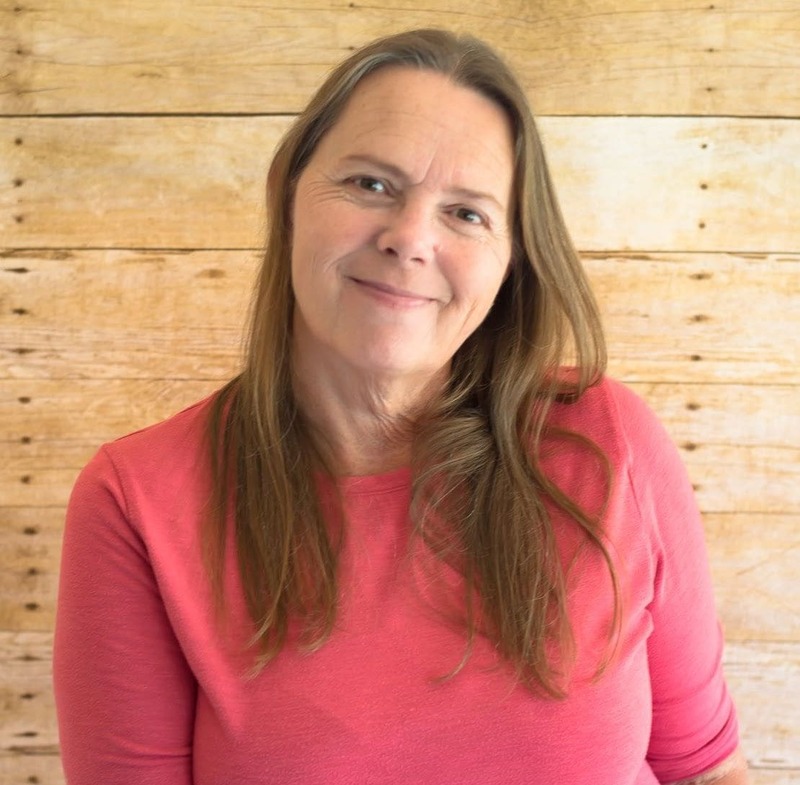 Thanks for stopping by and leaving a comment!